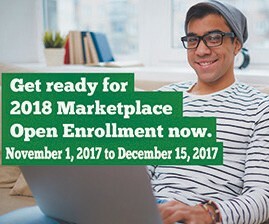 The enrollment period to be covered by the federal Affordable Care Act (ACA) began Nov.1st, and is scheduled to end Dec. 15th, for those hoping to qualify for health care coverage beginning January 1, 2018. And yet, according to recent published reports, Pres. Trump’s efforts to strangle the ACA to discourage participation are coming up short. In fact, based on available numbers, people are enrolling at a higher, faster pace than last year at this time, and there’s every reason to believe that pace will continue the closer Dec. 15th comes. This doesn’t account for over a dozen states that have their own health insurance exchanges. However, several states, like California, New York and Connecticut, all say they are seeing more signups over last year as well. Premiums on some health insurance plans can be subsidized as low as $87.00 per month from a high of $662.00, depending on the type of plan an applicant needs and signs up for. To make sure Pres. Trump’s efforts to squash the ACA signup period fails, several advocacy groups across the nation, including the NNPA, have stepped forward, making sure that their constituencies are properly informed about all ACA deadlines and requirements.